(IRDN) was established in 1998. The immediate objective of IRDN was to build an infrastructure which can deliver emergency relief aid through the 78 Subud centres located throughout Indonesia. While initially focusing on relief, the long-term goal is to promote self-reliance through the creation of co-operatives. Already some Subud groups have well functioning co-operatives, one good example of which is the Wungu Co-operative in Madiun (East Java), which was established in 1992 with SD Indonesia funding. IRDN operates under a Board of Directors that consists of Subud members who have expertise in emergency relief and development, cooperatives, children’s issues, education and financial management. Each Board member is to have a young (volunteer) counterpart who will support the work of the Board while learning about relief and development. Ibu Ismana Haryono, Vice Chair (Education), Suryadi Haryono, Treasurer, Olvia Beauthauville-Reksodipoetro, Secretary, Indrawati Bambang Indartono (Children’s Issues), Empu Widjojo (Co-operatives), Stephan Solat (Community Health & Development). 1. Focussing to the transmigration community neighbor at Tengkiling, Kalimantan: The first intention is to have a revolving micro-credit program for about 3 to 5 years, and till June 2001 that would be the initiation phase benchmark. This initiation effort will try to provide credit farming / fishery capital scheme to at least 20-25 poor transmigration. Beside the capital we also provide skill training on their preferred farming program. The second intention is to provide the basic needs provision, e.g. clean water and other life skill training, including cooking, pineapple jam, home-economics etc. 2. Child to child program (expansion of the urban-slum pilot at Tambora, Jakarta to be adapted for rural setting). This is a kind of basic morale education on the idea of the spirit to "do for others" to the kids, while they are learning to implement "healthy living" behavior. 3. Improvement of nutritional status of under-five children through tempe blended food distribution, family nutrition education and growth monitoring efforts. 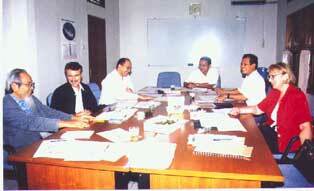 IRDN has established a tempe factory in Bogor to provide the supplement at cost. 4. Small supports to the existing Subud community development activities. These small support packages have the purpose of enhancing or enlarging the value added result or spill over impact of the original development project outcomes. So far, we have identified three packages of support, i.e. (1) provide concrete well to a group of female farmers (and families) who are now farming vegetables; (2) support a group of kelapa sawit farmers to building an asphalt way in order to access the main street near their farming field and (3) support a youth group who are doing mechanical-work services but currently their dynamo machine is not working and needs to be mended. The IRDN is a project under Susila Dharma Indonesia and was established in 1998 in response to the economic collapse in Indonesia. Please give your name as on card, address, card type, number of the account and purpose of payment (Earmarked: “for Emergency Relief Project – Indonesia”).